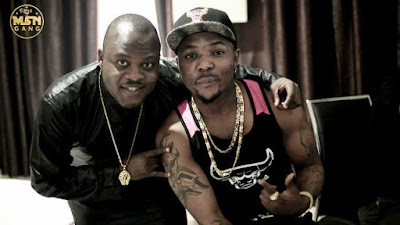 The drama between pop star, Oritse Femi, and his estranged manager, Danku, keeps getting hotter by the week. Just last week, the singer’s ex-manager claimed he picked up the ‘Double Wahala’ singer from the slums of Ajegunle and made him a star. This apparently did not go down well with the singer as he bared his soul in an exclusive chat with Saturday Beats. Oritse Femi explained what led to their fallout and cleared the air about how he met his estranged manager. He said, “Danku just left the house one day and never came back. I don’t have anything against him. The day he left, I was not home, he just took my Acura MDX SUV and all the Money I had in his account. I feel that is a criminal act and it is enough for me to arrest him. I have just been watching him without saying a word but I think it is time to talk. I went to Ondo State and before I got back, Danku had disappeared. I called him that I had returned and he should come home, he said okay, but never came back. “During that period, my Instagram account was hacked and it was reactivated by one of D’banj’s friends, Harold. I gave Danku N50,000 to pay Harold but he did not pay and Harold did not grant me access to my account. At first, Danku did not tell me that he did not pay the guy, instead he said that my Instagram account had expired and I was marvelled. I got Harold’s number and he told me he was never paid. I called Danku to ask why he did not pay Harold, all of a sudden, he told me I should never call him in my life and if I tried it, he would place a curse on me. He said my problem was too much and he didn’t want to have anything to do with me. “I had to involve D’banj who helped us to settle the problem with Harold. I told Danku I would understand if he wanted to be left alone but he should return my money and car but he refused. I have decided to sue him.” The singer alleged he empowered Danku’s mother even though he did not get his own mother a job. He said, “I placed my mother on a monthly salary but I empowered his mother’s business with N1m. She is into a business where she needs boats and I bought her two other boats with the one she had before. When his grandmother died, I spent a lot of money to bury her on his behalf. All these his family members know.” “He said he brought me out of the slums of Ajegunle but I met him in 2014 through a mutual friend who owns Cash Entertainment. He is a big liar to say he used to give me money. He has never given me any money in his life. He knows me especially when I was in Ikeja; boys in the area know how I give people money. I am not a stingy person. I started making money since I was a young boy and my people in Ajegunle know me. I have housed so many boys in Ajegunle so how would he say he used to give me money? I knew him after I released my song, ‘Double Wahala’. It is a blatant lie for him to say he promoted the hit song. I introduced him to so many television stations because I allowed him to represent me. If he says he was the one that promoted ‘Double Wahala’ for me, was he the one that helped me to promote the song, ‘Mercies of the Lord? I did not know him till 2014 to show that he is a liar.” While alleging he was the one who clothed Danku, Oritse Femi claimed his ex manager still wears the clothes he bought for him till date. “He says he owns MSN Gang but that is a big lie. I registered that company name myself and created every logo of the company. He now manages an artiste, Rayce, and he put my logo on the guy’s work after I warned him not to do so. Because of that, I will let the law decide who is wrong between us. He has never given me money in his life; instead I have always been the one giving him money. I have witnesses to prove this. When he was ill, I was the one that picked his hospital bill, I have all the receipts. I am taking him to court him and he will have up to 20-count charge. Why will he leave my house with my car and money? He has been lying about me and I would sue him for defamation of character. How would someone whom I do not know from Adam say he picked me up from Ajegunle? “This year would mark my 25th year as a singer; I started from Sunday Rendezvous in 1996. The first multinational show that I performed at was Benson and Hedges golden show. Where was Danku then? He has been dancing to my songs since he was a kid and he knows I am a legend in this country. He used to tell me all this and now, he tells people he brought me from the slum; this was someone I fed. I am going to sue Danku, his artiste, Rayce, and one HD who shot the video because they used my logo without my permission. “I will arrest Danku and his mother as well and all the money I spent on him would be recouped. If they don’t arrest him, I will impound the boats because I was the one that bought them,” he said.